His life had been disrupted, but not his billing cycles. There are people who say life is dull. Just a series of mundane events. But I can’t agree. Things happen. Bet on that. Nearly everyone could be undone by an old woman’s displeasure. 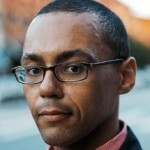 Victor LaValle is an American author who was raised in the Flushing and Rosedale neighborhoods of Queens, New York. He is the author of a short-story collection, Slapboxing with Jesus and three novels, The Ecstatic, Big Machine and The Devil in Silver. LaValle writes fiction primarily, though he has also written essays and book reviews for GQ, Essence Magazine, The Fader, and The Washington Post, among others.